Frank Peterson is DECA’s Acting Executive Director, bringing 14 years of experience at DECA Inc. Prior to this role, Frank most recently served as Chief Communications and Marketing Officer, responsible for leading strategic and integrated communications and marketing functions that promote, support and continue to elevate the organization. 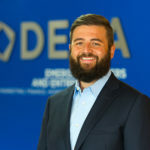 He played a significant role in the rebranding of the organization, designed the current logo and managed all of DECA’s collateral and marketing materials. He managed design and production schedules for all DECA’s major publications including the DECA Guide, DECA Direct the Magazine and DECA’s conference programs. He also led the re-branding of Shop DECA. Frank has also previously served as Interim Executive Director. Frank graduated from George Mason University with a bachelor’s Degree in Graphic Design, and he minored in Multimedia Communications. Frank is a member of the American Marketing Association (AMA) and is working toward his Professional Certified Marketer (PCM) designation. He is also a member of the American Institute of Graphic Arts (AIGA) which is the leading professional association for designers.